It was still quite steamy this morning. The windows were even fogged. Yuck. Tonight they are calling for mid 60s. I'll believe it when I see it at this point. Sigh. 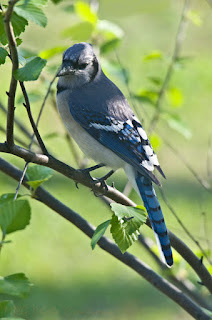 This image goes back to cooler days this Spring when a Blue Jay came to visit. We have a River Birch in the Front yard that the birds seem to really enjoy. It made for a nice spot for the image anyway.